Jimmy Buffet's Margaritaville is one of the more lively and whimsical restaurants in Las Vegas. With its Caribbean sail boat theme, Margaritaville entertains diners with balloon making stilt walkers that roam around the tables. The popular singer's signatures songs play continuously, along with videos, throughout the restaurant. It's a great laid back place for families. Kids and Adults alike can go and enjoy a tasty and affordable meal. 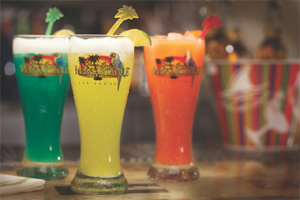 Margaritaville features traditional pub type food including large, yet imaginative salads, crab cakes, and of course the popular 'Cheeseburger in Paradise'. It is a 7-ounce Angus beef and grilled sirloin burger topped with pineapple rum. There is a wide selection of specialty margaritavilleed drinks from the multiple bars to go along with your meal including, of course, margaritas. Desserts include sponge cake and key lime pie.